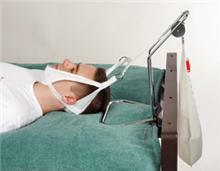 Bed Traction Unit for cervical traction. Perfect for home health care. Broad base with adjustable pulley height for any bed or traction angle. Includes Diskard head halter (#60383), spreader bar, rope and instructions.